A medical doctor and pharmacist by profession, Antoine Mifsud Bonnici started his political career in his university days, when he served as President of the Ħamrun Sectional Committee of the Nationalist Party. Now 73 and, up until a few weeks ago, the oldest Member of Parliament, Mifsud Bonnici’s decision to refrain from submitting his candidature for these elections marks the end of a political career that lasted over half a century. Aiming at continuing his legacy is his second-born daughter Paula, who with his support, has contested these general elections in the first district under the Nationalist ticket. Moving on to his political career, Mifsud Bonnici enlisted his political achievements as of pre-independence to the last general elections. 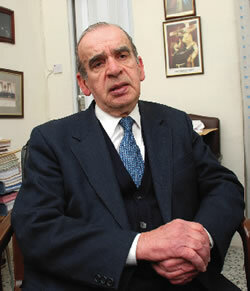 Mifsud Bonnici’s first official appointment was as parliamentary secretary for the elderly in 1992, which, to his disappointment, was not renewed after the Nationalist victory in 2003. Active involvement in the past 10 electoral campaigns does not only provide first-hand knowledge of how electioneering changed over the years, but also how politicians have reacted to the diverse propaganda tools and communication channels that developed through the years. “There is a lot of difference,” he said, referring to how electoral campaigns are held now to those held in previous years. “Decades ago, election campaigning was mainly dependent on mass meetings and on multiple corner meetings especially. The latter was the main vehicle for election propaganda. Election propaganda by post was also predominant. Media facilities as they are today were non-existent those days. Present day election campaigning revolves mainly on the media and house visits by candidates. Corner meetings are now obsolete. Postal propaganda is still very popular, however. The retired MP went on to describe the dynamics between former political opponents Fenech Adami and Mintoff and a comparison between their rapport to that of Lawrence Gonzi and Alfred Sant. “In my opinion,” he said, “there are more differences than similarities between the Gonzi-Sant rapport and the Fenech Adami-Mintoff rapport. Mintoff, who was a charismatic figure in his prime years, and who enjoyed an uncontested popularity those times, in time realised that Fenech Adami was a political leader and opponent who was proving his worth as an alternative leader, especially within those social strata where he had so much influence. Mintoff, without any doubt, appreciated the capabilities of Fenech Adami and in turn Fenech Adami, without conceding anything, always showed respect to Mintoff as a long-standing politician. Besides the quasi-comic, cheeky reply he had given to Fenech Adami upon the announcement of his non-reappointment in 2003, Mifsud Bonnici enlisted another two less comical anecdotes that marked his long political career. “During the 1976 election campaign, Labour Party thugs ransacked my car in front of my house while my wife, my five children and I looked at them helplessly,” he said. In the days when family fall-outs caused by partisan divergences were the order of the day, Antoine Mifsud Bonnici contested in the same district as his brother Karmenu under different party tickets. For a number of years, the brothers also sat on different sides of the parliament hall, including the 1984-1987 term when Karmenu served as Prime Minister. The Mifsud Bonnicis however, date much further back in politics.